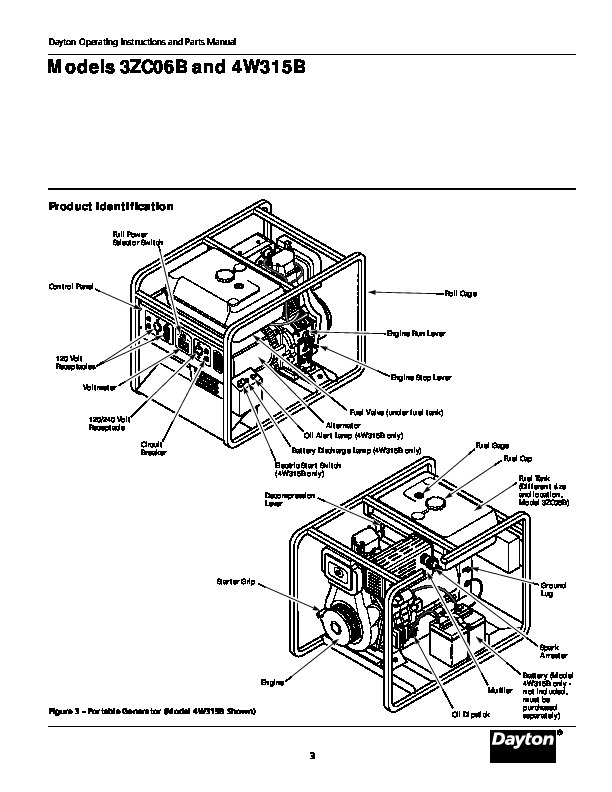 Operating Instructions & Parts Manual 3ZC06B and 4W315B Please read and save these instructions. 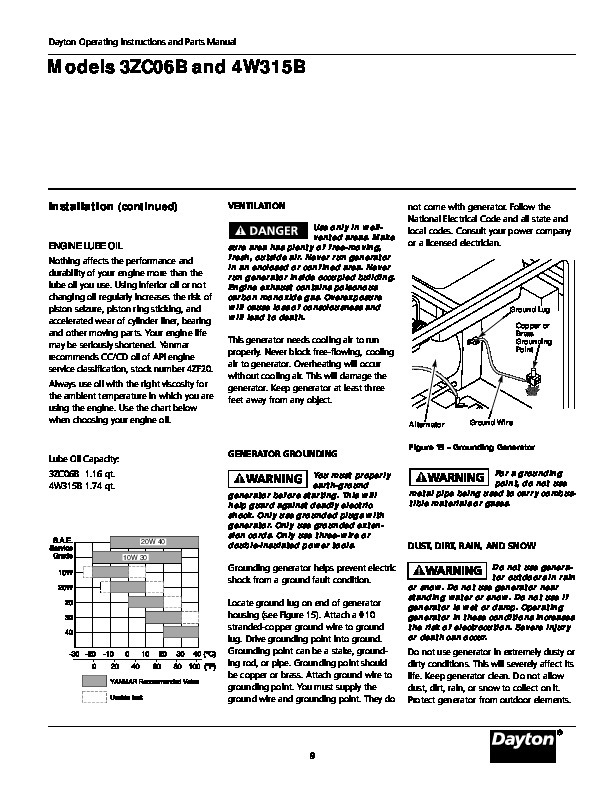 Read carefully before attempting to assemble, install, operate or maintain the product described. Protect yourself and others by observing all safety information. Failure to comply with instructions could result in personal injury and/or property damage! Retain instructions for future reference. 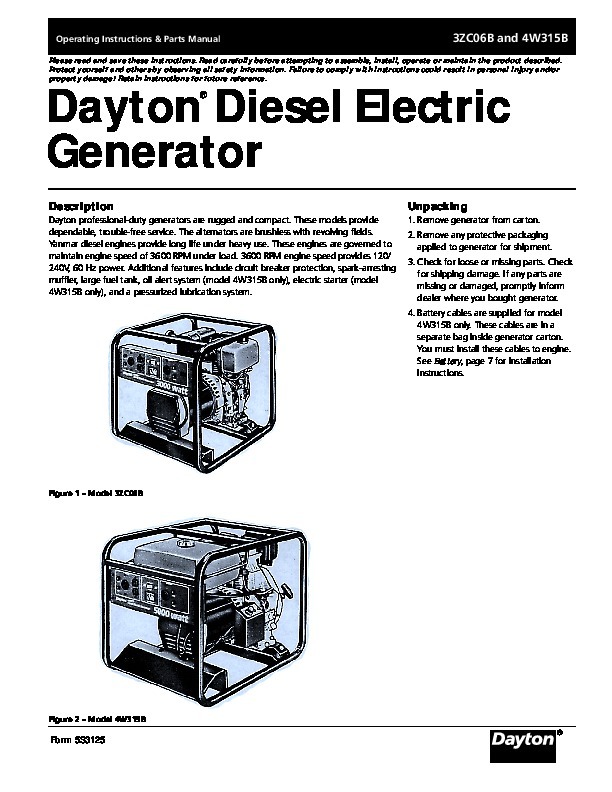 Dayton Diesel Electric Generator ® Description Dayton professional-duty generators are rugged and compact. These models provide dependable, trouble-free service. The alternators are brushless with revolving fields. Yanmar diesel engines provide long life under heavy use. These engines are governed to maintain engine speed of 3600 RPM under load. 3600 RPM engine speed provides 120/ 240V, 60 Hz power. Additional features include circuit breaker protection, spark-arresting muffler, large fuel tank, oil alert system (model 4W315B only), electric starter (model 4W315B only), and a pressurized lubrication system. Unpacking 1. Remove generator from carton. 2. Remove any protective packaging applied to generator for shipment. 3. Check for loose or missing parts. Check for shipping damage. 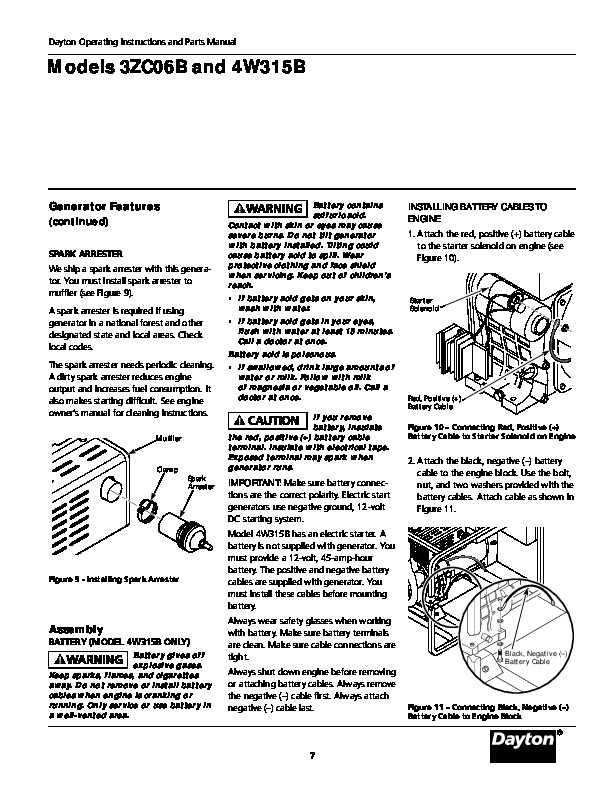 If any parts are missing or damaged, promptly inform dealer where you bought generator. 4. Battery cables are supplied for model 4W315B only. These cables are in a separate bag inside generator carton. You must install these cables to engine. 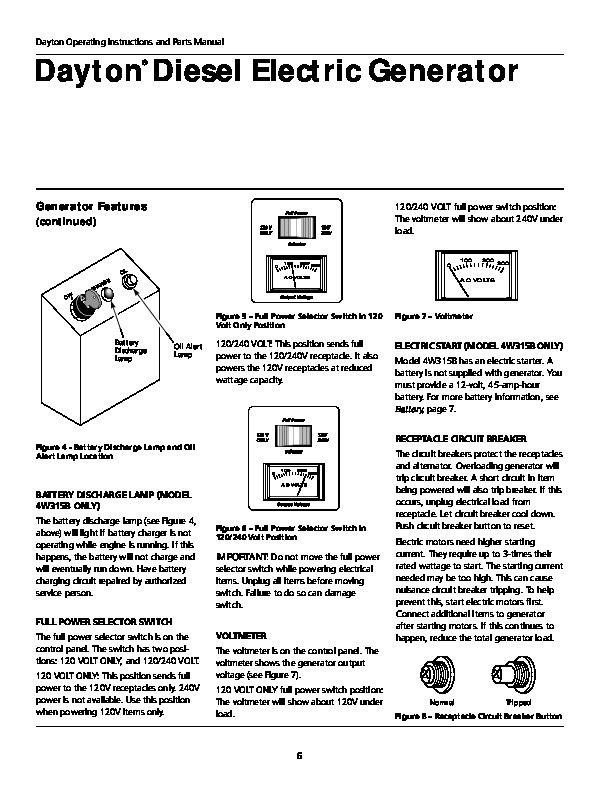 See Battery, page 7 for installation instructions. 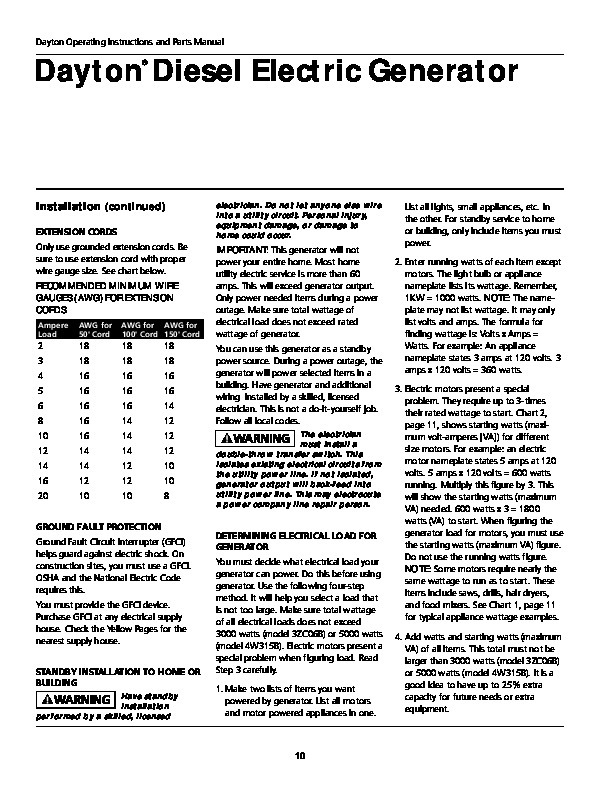 Figure 1 ­ Model 3ZC06B Figure 2 ­ Model 4W315B Form 5S3125 Version B – For Reduction G016.J ® Dayton Operating Instructions and Parts Manual Dayton Diesel Electric Generator ® Specifications ELECTRICAL SPECIFICATIONS Model Rated Wattage* Maximum VA Rated Amperage 120V Rated Amperage 240V 3ZC06B 4W315B 3000 5000 4000 6500 25 41.7 12.5 20.8 * Single-phase, 1.0 power factor NOTE: Ratings apply to SAE standard conditions. Reduce ratings 3 1/2% for each 1000 feet above sea level and 1% for each 10° Fahrenheit rise above 60°F. 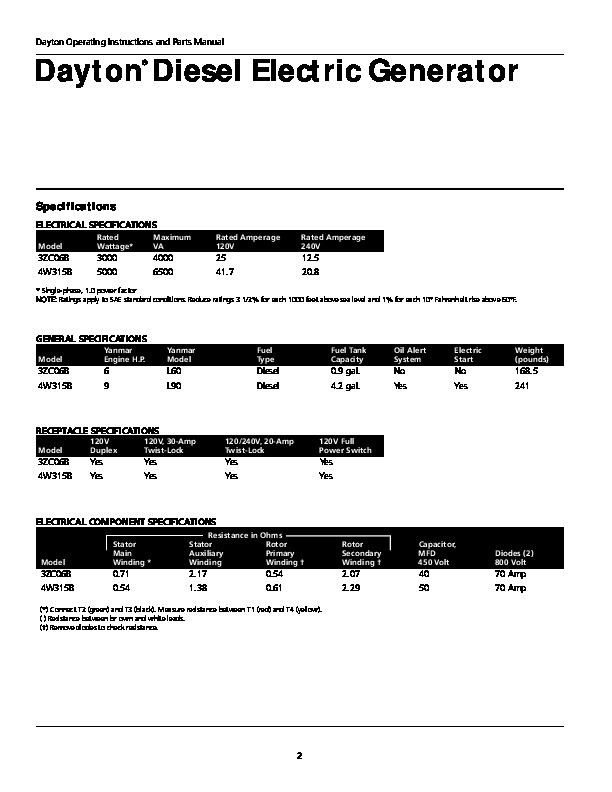 GENERAL SPECIFICATIONS Model Yanmar Engine H.P. Yanmar Model Fuel Type Fuel Tank Capacity Oil Alert System Electric Start Weight (pounds) 3ZC06B 4W315B 6 9 L60 L90 Diesel Diesel 0.9 gal. 4.2 gal. No Yes No Yes 168.5 241 RECEPTACLE SPECIFICATIONS Model 120V Duplex 120V, 30-Amp Twist-Lock 120/240V, 20-Amp Twist-Lock 120V Full Power Switch 3ZC06B 4W315B Yes Yes Yes Yes Yes Yes Yes Yes ELECTRICAL COMPONENT SPECIFICATIONS Stator Main Winding * Resistance in Ohms Stator Rotor Auxiliary Primary Winding Winding Rotor Secondary Winding Capacitor, MFD 450 Volt Model Diodes (2) 800 Volt 3ZC06B 4W315B 0.71 0.54 2.17 1.38 0.54 0.61 2.07 2.29 40 50 70 Amp 70 Amp (*) Connect T2 (green) and T3 (black). Measure resistance between T1 (red) and T4 (yellow). ( ) Resistance between br own and white leads. () Remove diodes to check resistance. 2 Dayton Operating Instructions and Parts Manual Models 3ZC06B and 4W315B Product Identification Full Power Selector Switch Control Panel E F Roll Cage 120 VO LT S 120 ON LY FU LL PO WE R Engine Run Lever 120 /24 0V 120 /24 0 VO LT S SEL ECT OR N RU 0 10 0 20 0 30 AC OU TP UT OP ST VO LT S VO LT AG E 120 Volt Receptacles Engine Stop Lever Voltmeter Fuel Valve (under fuel tank) 120/240 Volt Receptacle Circuit Breaker Alternator Oil Alert Lamp (4W315B only) Battery Discharge Lamp (4W315B only) Electric Start Switch (4W315B only) Decompression Lever E F Fuel Gage Fuel Cap Fuel Tank (Different size and location, Model 3ZC06B) Starter Grip Ground Lug Spark Arrester Battery (Model 4W315B only not included, must be purchased separately) ® Engine Muffler Figure 3 ­ Portable Generator (Model 4W315B Shown) Oil Dipstick 3 Version B – For Reduction G016.J Dayton Operating Instructions and Parts Manual Dayton Diesel Electric Generator ® General Safety Information IMPORTANT: Read these instructions and engine owner’s manual carefully. 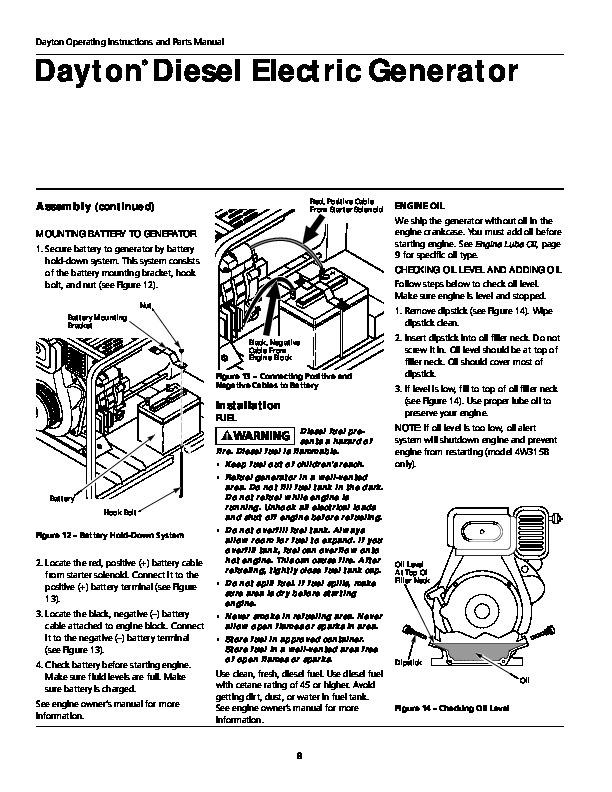 Become familiar with generator before trying to operate or service it. Know its uses, limitations, and any hazards involved. Improper use of generator can cause severe injury or death from explosion, fire, burns, electrical shock, or carbon monoxide poisoning. Make certain you read and understand all warnings. Keep these instructions for reference. They are your guide to safe and proper operation of this generator. Safety information appears throughout these instructions. Pay close attention to them. 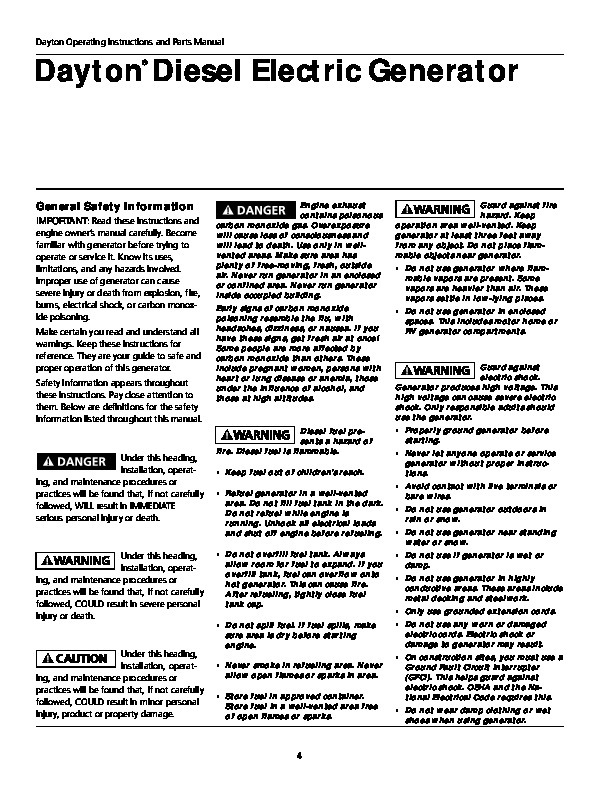 Below are definitions for the safety information listed throughout this manual. Engine exhaust contains poisonous carbon monoxide gas. Overexposure will cause loss of consciousness and will lead to death. Use only in wellvented areas. Make sure area has plenty of free-moving, fresh, outside air. Never run generator in an enclosed or confined area. Never run generator inside occupied building. Early signs of carbon monoxide poisoning resemble the flu, with headaches, dizziness, or nausea. If you have these signs, get fresh air at once! Some people are more affected by carbon monoxide than others. These include pregnant women, persons with heart or lung disease or anemia, those under the influence of alcohol, and those at high altitudes. Guard against fire hazard. Keep operation area well-vented. Keep generator at least three feet away from any object. Do not place flammable objects near generator. 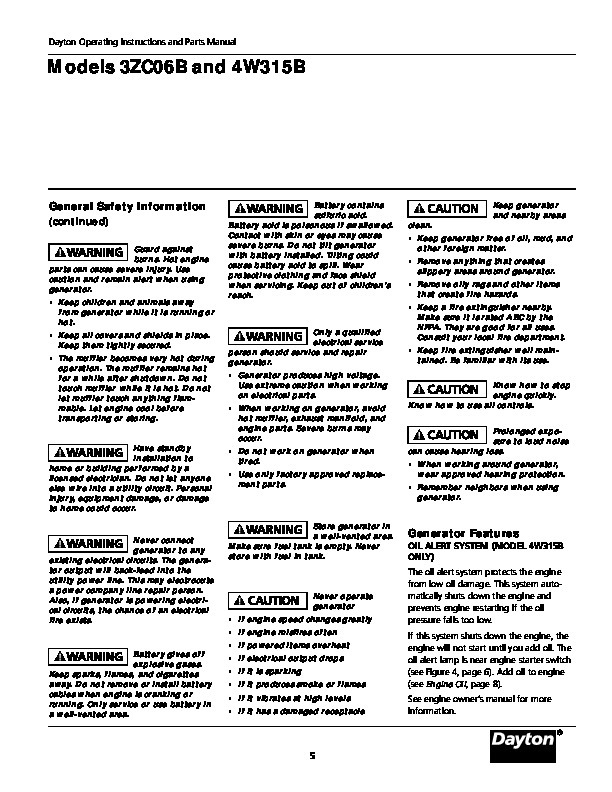 · Do not use generator where flammable vapors are present. Some vapors are heavier than air. These vapors settle in low-lying places. · Do not use generator in enclosed spaces. This includes motor home or RV generator compartments. Guard against electric shock.